FORMER EastEnders star Charlie Clement heads for Woking next week and the one thing he refuses to leave at home are … his boxing gloves. His Albert Square character Bradley Branning may have come to a sticky end after a rooftop police chase, but the actor is still fighting fit – literally. “I don’t actually box,” he confesses. “I’ve never been punched in the face. But I started boxing training when I was in America and there was a boxing gym at the end of the road. 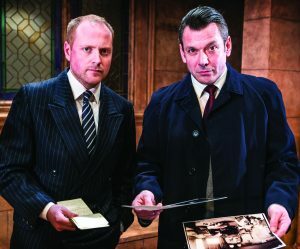 The Case of the Frightened Lady will be at the New Victoria Theatre, Woking, from Tuesday 3 April until Saturday 7 April.